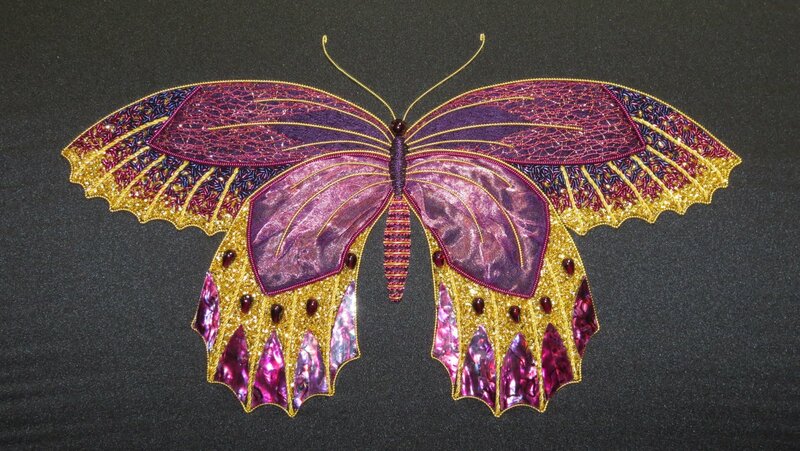 Royal Butterfly is not a small butterfly like the others in my range of kits – it is a large piece and requires lacing on a frame to work the design. It features a range of techniques aimed at both beginners and advanced embroiderers alike – from long and short stitch and chipping through to using paua shell laminate and Grecian – there is bound to be something for you. The piece is worked in English Gilt Goldwork threads, Indian coloured sadi threads, Kreinik metallic braid, garnets, paua shell, net ribbon and Au Ver a Soie silk to name a few of the threads in the kit. The design size is 15cm x 28cm.